Maintain optimum feed conversion rates using SeeMate™ PLUS underwater cameras to monitor fish behavior, feed pellet drop rates, and best pellet broadcast positioning over the cage surface. Ideal for monitoring net billowing and current strength during feeding regime to ensure all feed reaches the fish. Equally at home monitoring vessels, tanks and raceways for environmental conditions, fish and aquatic species health. No matter what the application SeeMate™ PLUS cameras are designed for the worst long-term immersion operating environments with a tough polyurethane jacketed cable assembly sealed directly to the Acetal™ co-polymer camera housing. This ensures an incredibly reliable underwater video camera system with literally thousands of units operating in the field. All SeeMate™ PLUS cameras are manufactured using a tough Acetal® co-polymer underwater housing fitted with a thick boron silicate viewing glass. The tough durable underwater camera housing positions a range of Sony® CCD chip based cameras sourced for their 0.01 lux (0.001 lux available with some camera models) low light operating capabilities. Camera models include a choice of Black and White, Colour and Colour/Monochrome options with each camera offering special features and advantages that can be further augmented with a range of camera lenses for best viewing angle and depth of field. SeeMate™ PLUS cameras operate with polyurethane jacketed underwater cable assemblies designed for long-term immersion in a saltwater environment. This cable is hardwired connected into the underwater housing to ensure a 100% trouble-free interface for the worse operating conditions where operator maintenance review is limited due to site access and operating conditions. This direct wired camera configuration is ideal for extreme underwater environments. Both 30-meter/100-foot and 39- meter/125-foot cable lengths are available with the opportunity to select alternative lengths as needed to address your specific underwater viewing depth requirements. IAS utilizes field serviceable Bulgin® 700 Series IP68 rated inline connectors to ensure best possible field operations. To eliminate costly downtime a simple crescent wrench and flat blade screwdriver addresses the field change out of this connector within 10 minutes. SeeMate™ PLUS cameras may be positioned within a Net Ring assembly as shown in the accompanying image. 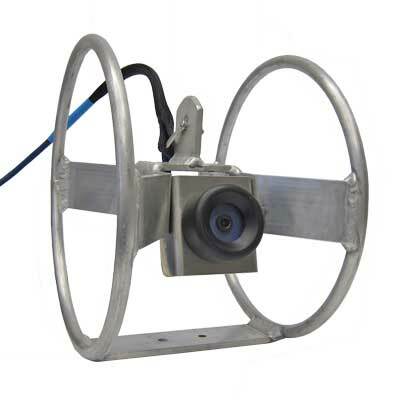 This camera mount platform allows for operator adjustment of the viewing angle and provides a ready-made camera cable reel onto which to coil the polyurethane cable. Alternatively a simple ‘J’ Hooks shaped camera mount is also offered for those wishing an even lower camera operating profile. Maximum product operating life with a tough unbreakable housing that will withstand prolong submerged operation at over 24-bar/350 psi. Hardwired camera cable to underwater housing interface does not require scheduled inspection of a rear housing mounted connector. Ideal for extreme environment applications. A thick boron silicate lens ensures best product longevity in toughest of environments. Easily change out cable to monitor plug assembly without need to return product for servicing. B&W, colour, and colour/monochrome cameras address a wide range of applications. Visual camera images of feed placement; feed drop rates; feed placement in relationship to fish location and fish feeding behaviors provide the necessary feed information required to ensure all broadcast feed is consumed. Select from a broad range of lens types to address underwater field of view and depth of view requirements when working with large cage sizes. Cable is able to withstand long-term immersion in saltwater environments. A versatile simple to deploy rugged camera ideal for inspecting net integrity and fouling; monitoring anchors ropes and chains; and walkways and floats. Convenient camera platform and cable reel together in one package makes end of season camera storage neat and simple.